Jim began painting as a teenager and eventually studied design and color theory at the University of Connecticut. Through workshops and self-study, Jim has cultivated a bold representational painting style that balances the impressionists’ influence with contemporary subject matter. 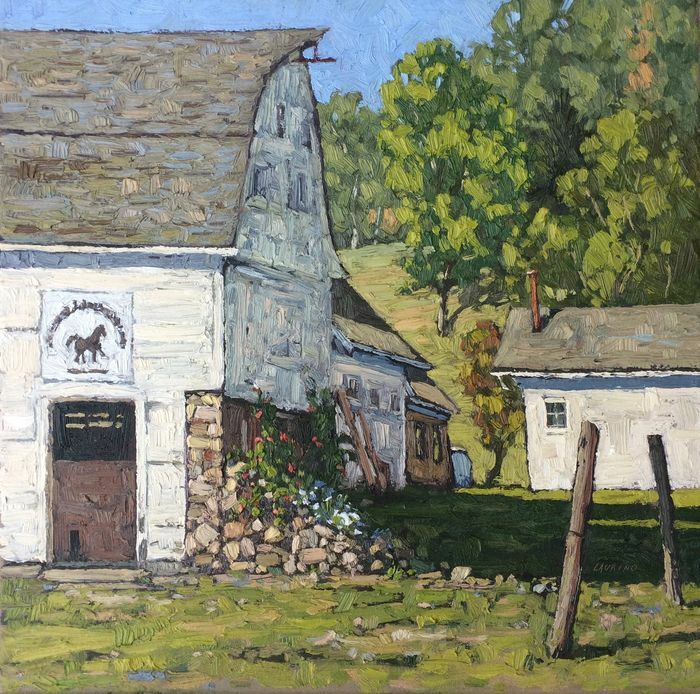 His expressive application of paint, married with a keen eye for classic New England scenes, charms the viewer and truly makes his work unique. Jim constructs frames for all of his paintings. The frames, which are made out of reclaimed wood material, fashion a rustic window into each piece, subtly complimenting his work. A brief write-up of Jim’s approach to painting and framing was featured in Plein-Air magazines’ Jan 2018 issue. Jim’s paintings are in numerous private collections. He shows his work in galleries throughout the nutmeg state, and enjoys participating in competitive events across the Northeast. Jim is proud to be a longstanding member of the Lyme Art Association, and exhibits there frequently. For more information about the artist please visit: www.jimlaurino.com.